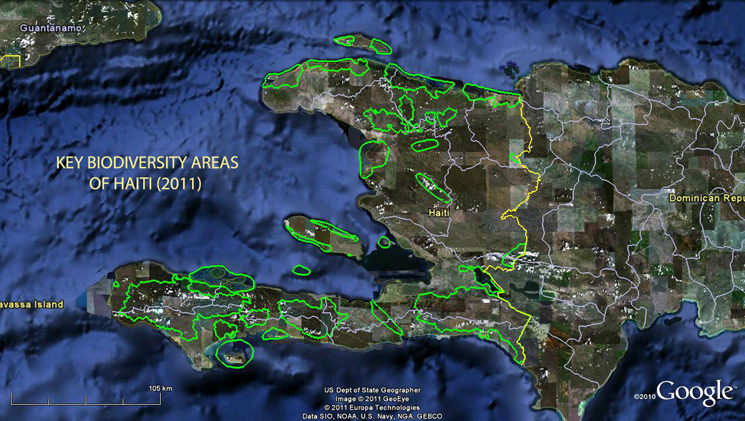 The Key Biodiversity Areas (KBAs) of Haiti are considered by scientists as the critical areas of the country that are home to the threatened plant and animal species unique to the island. Many of these species only occur in Haiti and nowhere else in the world. A large knowledge gap exists in knowing the exact number of species and their natural distribution. However, what we know already is sufficient to prioritize areas of Haiti resulting in a document that describes 31 areas of the country that contain 136 threatened taxa and 30 taxa of special concern. We hope that an awareness among government and non-government organizations will yield positive results toward legal protection. The document is available in English, French and Creole. Download English version. Download French version. Download Creole version.